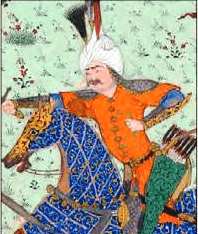 Persian literature (Persian: ادبیات فارسی‎‎) is one of the world's oldest literatures. It spans two-and-a-half millennia, though much of the pre-Islamic material has been lost. Its sources have been within Greater Iran including present-day Iran, Iraq, the Caucasus, and Turkey, regions of Central and South Asia where the Persian language has historically been either the native or official language. For instance, Rumi, one of best-loved Persian poets, born in Balkh or Vakhsh (in what is now Afghanistan), wrote in Persian, and lived in Konya, then the capital of the Seljuks in Anatolia. The Ghaznavids conquered large territories in Central and South Asia and adopted Persian as their court language. There is thus Persian literature from Iran, Mesopotamia, Azerbaijan, the wider Caucasus, Turkey, western parts of Pakistan, India, Tajikistan and other parts of Central Asia. Not all Persian literature is written in Persian, as some consider works written by ethnic Persians in other languages, such as Greek and Arabic, to be included. At the same time, not all literature written in Persian is written by ethnic Persians or Iranians, as Turkic, Caucasian, and Indic poets and writers have also used the Persian language in the environment of Persianate cultures. Described as one of the great literatures of humanity, including Goethe's assessment of it as one of the four main bodies of world literature, Persian literature has its roots in surviving works of Middle Persian and Old Persian, the latter of which date back as far as 522 BCE, the date of the earliest surviving Achaemenid inscription, the Behistun Inscription. The bulk of surviving Persian literature, however, comes from the times following the Islamic conquest of Iran c. 650 CE. After the Abbasids came to power (750 CE), the Iranians became the scribes and bureaucrats of the Islamic empire and, increasingly, also its writers and poets. The New Persian literature arose and flourished in Khorasan and Transoxiana because of political reasons——the early Iranian dynasties such as Tahirids and Samanids were based in Khorasan. I awaken the Ajam by this Persian [language]. One Thousand and One Nights (Persian: هزار و یک شب‎‎) is a medieval folk tale collection which tells the story of Scheherazade (Persian: شهرزاد‎‎ Šahrzād), a Sassanid queen who must relate a series of stories to her malevolent husband, King Shahryar (Persian: شهریار‎‎ Šahryār), to delay her execution. The stories are told over a period of one thousand and one nights, and every night she ends the story with a suspenseful situation, forcing the King to keep her alive for another day. The individual stories were created over several centuries, by many people from a number of different lands. The nucleus of the collection is formed by a Pahlavi Sassanid Persian book called Hazār Afsānah (Persian: هزار افسان‎‎, Thousand Myths), a collection of ancient Indian and Persian folk tales. The biggest Persian dictionary is Dehkhoda Dictionary (16 volumes) by Ali-Akbar Dehkhoda. He names 200 Persian lexicographical works in his dictionary, the earliest, Farhang-i Oim (فرهنگ اویم) and Farhang-i Menakhtay (فرهنگ مناختای), from the late Sassanid era. In 2002, Professor Hassan Anvari published his Persian-to-Persian dictionary, Farhang-e Bozorg-e Sokhan, in eight volumes by Sokhan Publications. Starting from the early 16th century, although certain aspects of more recent times were already incorporated since the 12th century, until the course of the 19th century, Georgian culture became significantly influenced by Persian culture. Though notably more visibly amongst the higher classes, Persian cultural aspects were incorporated amongst the already existing Georgian columns, which especially included literature, amongst others. No Sultan's pleasure could with ours compare. " During the last century, numerous works of classical Persian literature have been translated into Italian by Alessandro Bausani (Nizami, Rumi, Iqbal, Khayyam), Carlo Saccone ('Attar, Sana'i, Hafiz, Nasir-i Khusraw, Nizami, Ahmad Ghazali, Ansari of Herat), Angelo Piemontese (Amir Khusraw Dihlavi), Pio Filippani-Ronconi (Nasir-i Khusraw, Sa'di), Riccardo Zipoli (Kay Ka'us, Bidil), Maurizio Pistoso (Nizam al-Mulk), Giorgio Vercellin (Nizami 'Aruzi), Giovanni Maria D'Erme ('Ubayd Zakani, Hafiz), Sergio Foti (Suhrawardi, Rumi, Jami), Rita Bargigli (Sa'di, Farrukhi, Manuchehri, 'Unsuri). A complete translation of Firdawsi's Shah-nama was made by Italo Pizzi in the 19th century. Some researchers argue that the notion of "sociopolitical ramifications of esthetic changes" led to the idea of poets "as social leaders trying the limits and possibilities of social change. " ↑ C. A. (Charles Ambrose) Storey and Franço de Blois (2004), "Persian Literature - A Biobibliographical Survey: Volume V Poetry of the Pre-Mongol Period", RoutledgeCurzon; 2nd revised edition (June 21, 2004). p. 363: "Nizami Ganja’i, whose personal name was Ilyas, is the most celebrated native poet of the Persians after Firdausi. His nisbah designates him as a native of Ganja (Elizavetpol, Kirovabad) in Azerbaijan, then still a country with an Iranian population, and he spent the whole of his life in Transcaucasia; the verse in some of his poetic works which makes him a native of the hinterland of Qom is a spurious interpolation. " ↑ Abdolhossein Zarrinkoub, Naqde adabi, Tehran 1959 pp: 374-379. ↑ "مومن قناعت، شاعر و سیاستمدار". BBC Persian. Retrieved 2006-03-31. ↑ "فرزانه، صدای نسل نو". BBC Persian. Retrieved 2006-03-31. ↑ "همایش بزرگداشت افصح زاد" at BBC Persian. Accessed on 2006-03-31.